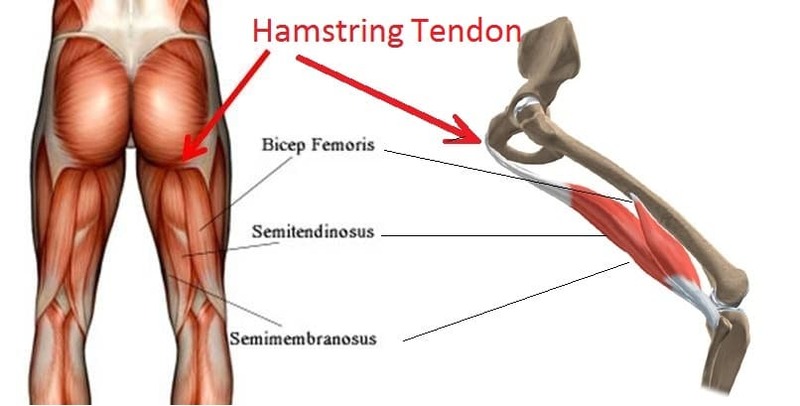 The hamstring tendon connects the hamstring muscle to the outer part of the knee. Hamstring tendonitis occurs when this tendon becomes damaged or inflamed because of excessive strain or force. The usual cause is overuse over time, especially among runners, jumpers, and footballers. Hamstring tendonitis can also occur suddenly if an athlete skips warm-up exercise completely or doesn’t warm up enough. People who are new to exercise or trying a more intensive exercise for the first time are also at risk for the injury. Hamstring tendonitis has also been linked to imbalanced thigh muscles or weak core muscles in some people. Slumping of the lower back or lumbar region has also been identified as a cause. People who suffer hamstring tendonitis generally feel pain in the back of the knee during activity. However, pain can also occur after long periods of inactivity such as lying or sitting. Patients, therefore, tend to feel pain and stiffness early in the morning and the knee joint may feel weak. In severe cases, pain and swelling may also occur in the thigh and calf muscle. When hamstring tendonitis is brought on by sudden force, the pain usually comes at the point of injury. A medical professional will examine the area in an effort to diagnose hamstring tendonitis. X-rays or MRI scans may also be carried out to confirm the diagnosis and look for other problems. Rest is a key component of treatment since the injury needs time to heal. The patient needs to stay off the knee. Applying ice is a common way of reducing swelling and inflammation and reducing pain. The RICE method (rest, ice, compression and elevation) can be over the first three days of healing. keeping the injured leg elevated will help to prevent further inflammation. Anti-inflammatory drugs may also be prescribed to reduce swelling and pain. Certain taping and strapping techniques may also be utilized to help relieve pressure and support the injured area. Some athletes continue to use these methods long after they have recovered to prevent hamstring tendonitis from recurring. Once the injury has healed, the doctor or physiotherapist will recommend a rehabilitation programme which includes strengthening and stretching. This will help the patient to eventually return to sports and normal activity. It is important not to push the injured area to the point of pain. If the hamstring tendonitis is severe or other treatments have not been successful, medical professions may administer steroid drug injections as a last resort. While these reduce inflammation and ease the pain, they may also weaken the tendon and lead to a rupture eventually. There are some gentle exercises which you can do to stretch your hamstring muscles. The first is the seated chair stretch. Sit towards the front edge of the chair and straighten one leg in front of you. Keep your heel off the ground and your toes pointed at the ceiling. Next, lean forward over the outstretched leg while keeping your back straight. You should feel the stretch in the back of your thighs. For a slightly more intense stretch, prop your heel on a stool rather than the floor. The stretch will be deeper the higher you place your foot. An intermediate level stretch is the supine hamstring stretch or towel hamstring stretch. To do this, lie on the floor with your left knee bent and your left foot flat on the floor. Keep your abdominal muscles tight and lift the straight right leg slowly upward. To make things easier, you can try wrapping an exercise band around your right instep and holding onto the ends to help you lift your leg. hold for at least 15 seconds, then lower the leg to the floor. Repeat this action three times per side.